Carte de Visite of a young woman identified on the reverse as Emma Bullard McNabb. The photograph was taken by the Irving J. Gross & Co. studio at No. 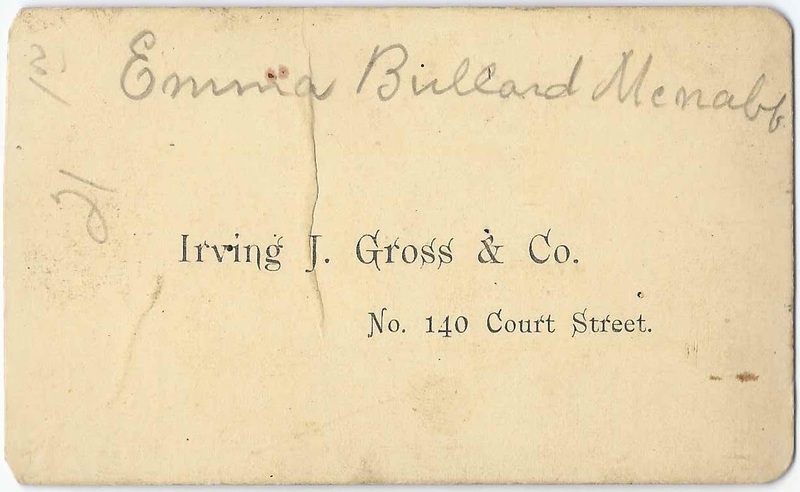 140 Court Street, Boston, Massachusetts, and may have been taken before or after Emma Bullard's marriage in 1874 at Boston, to James McNabb, a native of Pictou County, Nova Scotia. 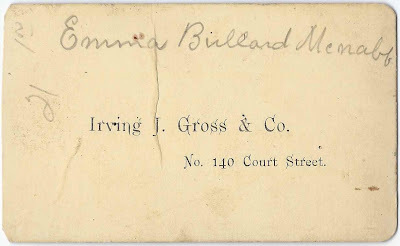 Mary Emma Bullard, the twin of Martha Ella Bullard, was born 12 July 1850 at Sebec, Maine, daughter of Jonathan and Nancy (Bradford) Bullard. 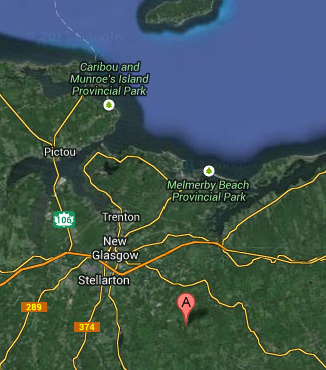 As late as the time of the enumeration of the 1870 Census, Emma was still in Maine, living with her family at Foxcroft, not far from Sebec. 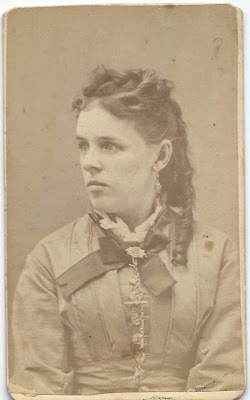 By 1874, she had made her way to Boston, Massachusetts, where she married James McNabb on 12 November 1874. 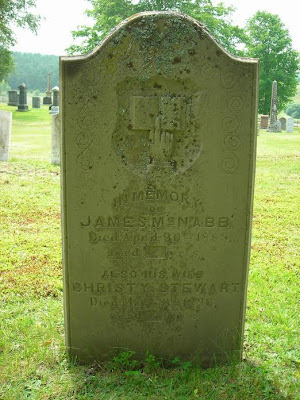 James was born about 1848 in Pictou County, Nova Scotia, the son of James and Christy (Stewart) McNab or McNabb of McLellan's Mountain in Pictou County, Nova Scotia. 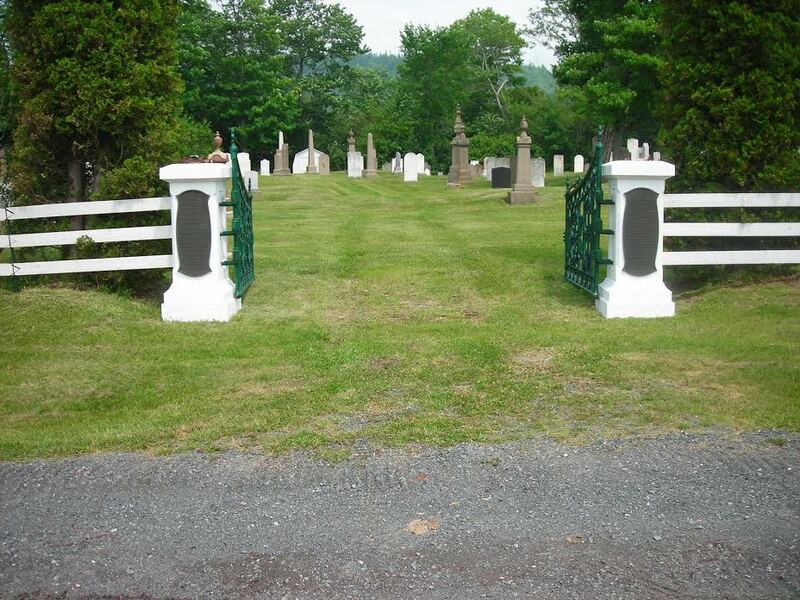 A reader was kind enough to forward a photograph of the gravestones of James and Christy (Stewart) McNabb. Here is the same gravestone shown beside the stone of John McNabb. 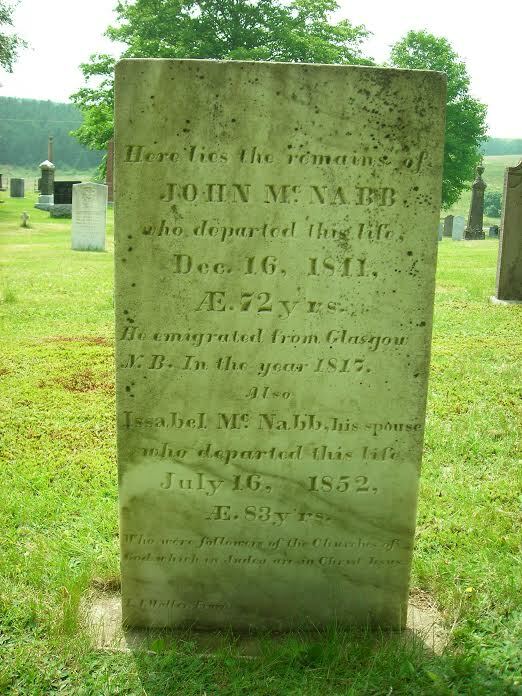 And a closeup of the stone of John McNabb. Below, the entrance to the Bridgeville Cemetery in Pictou County, Nova Scotia, where James and Christy McNabb are buried. 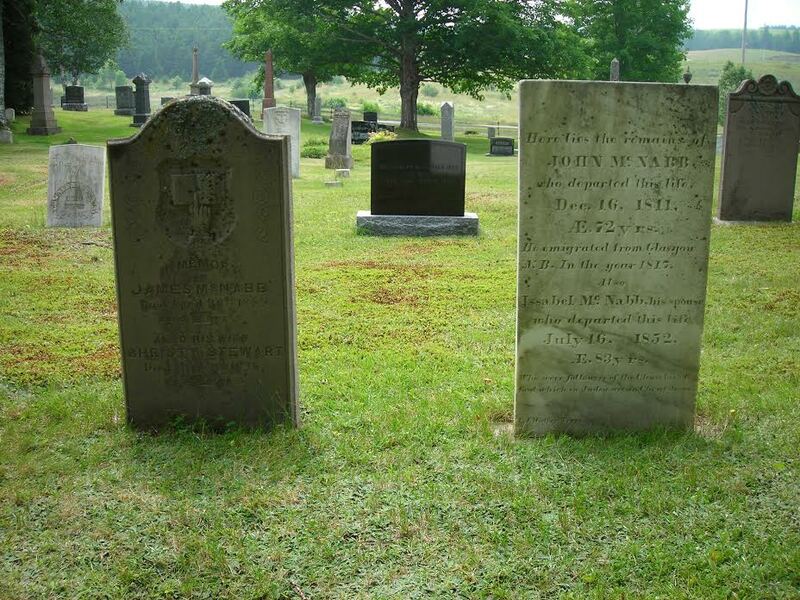 Young James McNabb and his wife Mary Emma (Bullard) McNabb were still living at Boston at the time of the 1880 Census. By that time they had a son, Harry John McNabb, born 3 December 1875. James was working in the retail end of boots and shoes. Whether he had his own shop by this time or not, I don't know, but I believe he eventually did. James and Emma would have at least two more children. Their son Lucius Bradford McNabb, born 7 May 1877 at Boston, died a year later on 19 June 1878. Edith Emma McNabb was born 7 January 1886. Sadly, Mary Emma (Bullard) McNabb died 3 February 1888 at Boston, Massachusetts. James and Edith were still living at Boston at the time of the 1900 Census but they subsequently moved to Somerville, Massachusetts. Harry John McNab married Minnie Eliza Jones and had at least one child, named Emma, presumably for his mother. Edith Emma McNabb lived a long life but I believe she never married. If you have corrections to the information above or additional information on the Bullard and McNabb or McNab families, please leave a comment or contact me directly.